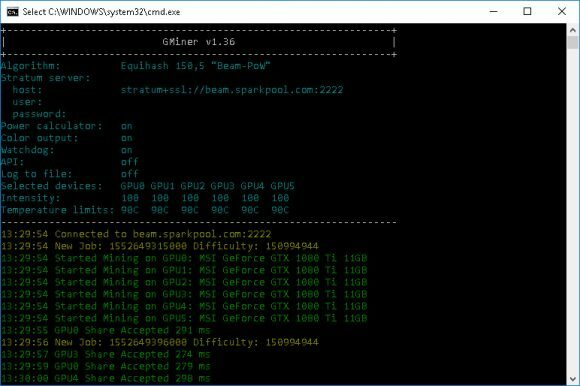 The latest two versions of GMiner 1.37 and 1.38 have increased the supported range of GPUs over what the miner was capable of running on regarding Grin, Swap and Aeternity mining as well as some additional algorithms now also supported on AMD GPUs. 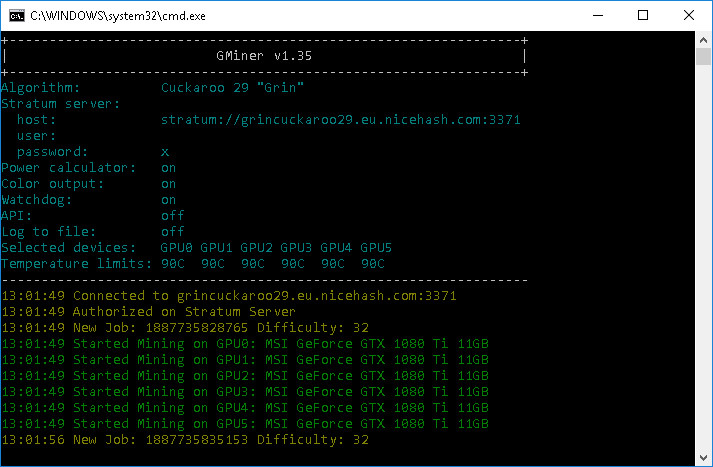 GMiner 1.37 added Equihash 144,5 and 192,7 solver support for AMD miners on top of the already existing Cuckaroo29, Cuckoo29, Cuckaroo29s and Equihash 150,5 as well as some minor performance improvements for beam on AMD cards. A 5GB solver for Grin29 / Swap / Aeternity was added as well that allows the mining on 6GB cards under Windows 10 and in the latest release that was further improved by adding 4GB solver for Grin29 and Swap that should work under Linux and Windows 7 on 4GB VRAM GPUs. 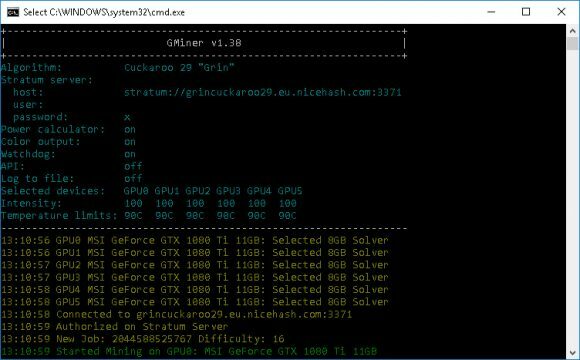 The GMiner miner requires an Nvidia GPU with CUDA compute capability 5.0 or later as well as CUDA 9.0 driver support, some algorithms are already supported on AMD GPUs as well (Cuckaroo29, Cuckoo29, Cuckaroo29s, Beam’s Equihash 150,5 as well as the recently added Equihash 144,5 and 192,7). Do note that GMiner is a closed source miner for Nvidia and AMD GPUs with binaries available for both Windows and Linux, also there is a 2% developer fee built-in the software. The latest GMiner 1.36 miner comes with significantly decreased CPU usage for cuckoo cycle algorithms for Nvidia GPUs (up to 40%), so it should handle better on mining rigs with lower-end CPUs. The new version also has added adaptive CPU usage adjustment for cuckoo cycle algorithms (increase hashrate on weak CPUs), do note that the miner need a few minutes to adapt CPU usage on a weak CPU. There is also an added option to control the GPU intensity (--intensity, 1-100) with the default intensity being 100, but lowering it may be useful for some mining rigs that have stability problems with the highest intensity. 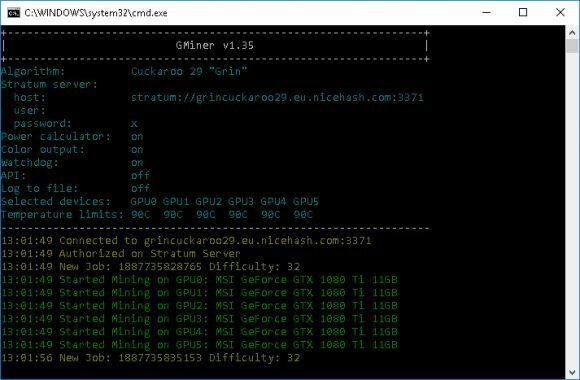 The GMiner miner requires an Nvidia GPU with CUDA compute capability 5.0 or later as well as CUDA 9.0 driver support, some algorithms are already supported on AMD GPUs as well (Cuckaroo29, Cuckoo29, Cuckaroo29s and Beam’s Equihash 150,5). Do note that GMiner is a closed source miner for Nvidia and AMD GPUs with binaries available for both Windows and Linux, also there is a 2% developer fee built-in the software. 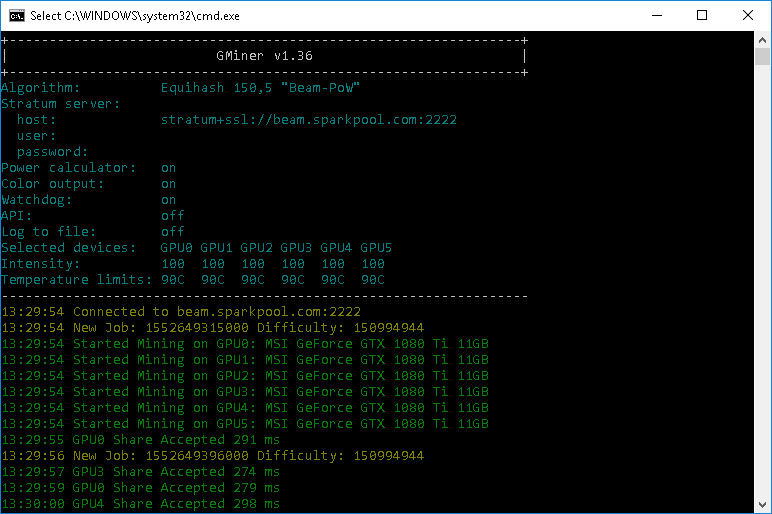 The newest GMiner 1.35 miner comes with improved performance for Grin29 and Swap on Nvidia cards, additional support for mining on AMD video cards for Grin29, Swap and Aeternity (adding to the already available support for BEAM), improved pool side hashrate for Swap and various bug fixes. 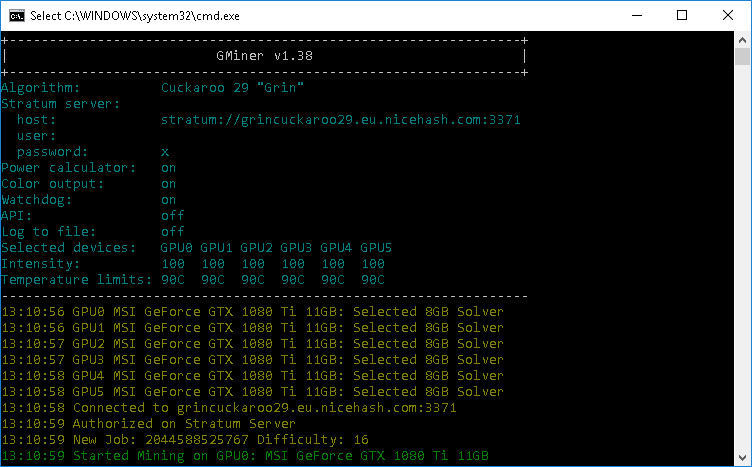 The performance for GRIN’s Cuckaroo29 and SWAP’s Cuckaroo29s algorithm is currently probably the fastest compared to other available miners (tested on Windows 10 with GTX 1080 Ti). The additional algorithms getting AMD GPU support is nice, though not that useful as these mining rigs are not performing that good with the specific algorithms and the expected profit is not attractive at all at this point. Still it is good to have more alternatives for miners for different algorithms, so it will be good to see GMiner getting support for additional algorithms on AMD as well. The GMiner Nvidia CUDA miner requires an Nvidia GPU with CUDA compute capability 5.0 or later as well as CUDA 9.0 driver support. Do note that GMiner is a closed source miner for Nvidia GPUs with binaries available for both Windows and Linux, also there is a 2% developer fee built-in the software.